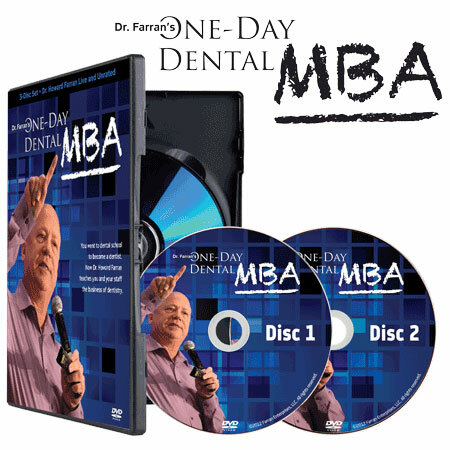 3 – disc DVD series of Dr. Howard Farran’s business of dentistry. You went to dental school to become a dentist. Now Dr. Howard Farran teaches you and your staff the business of dentistry. Dr. Howard Farran – dentistry’s most outspoken practice management guru is back with an all-new six-hour DVD. He shares his proven techniques to increase your productivity, boost your bottom line and build your business. Don’t miss his live and unfiltered insights on dentistry and business along with an insider’s view of his dental practice. Dr. Farran’s live lecture in Phoenix with exclusive insights into the successful practices used everyday at Today’s Dental. Dr. Farran’s off-the-cuff comments on the business of dentistry from his Howard Speaks series, bloopers from his live lecture and the dental practice and dental forms you can use in your practice today. Content may not be suitable for all viewers.